The Common Loon is typically found in wilderness areas such as Minnesota’s Boundary Waters, so Lakeside Club owners are fortunate to be able to watch loons on Round Lake, which is currently home to a nesting pair of Common Loons and receives occasional visits by non-resident loons. Loons are very distinctive birds. The head of a mature Common Loon is jet black, with striking red eyes and a pointed black beak. Its plumage is a harmonious composition of contrasting black and white patterns. On the neck is a wedge-shaped band of narrow zebra-like vertical stripes over a solid black ring. The breast is white in front, with curved zebra stripes behind merging into a black back checkered with squarish white blobs. The weird, wild sounds of loon calls suggests that loons are ancient birds, as they are. An eerie wail helps loons locate one another. A wavering tremolo may indicate danger or announce a loon’s arrival at a lake. A yodeling call warns other loons to keep off the territory of a resident male loon. That warning call is not always effective—one of the two loon chicks that hatched on Round Lake in 2018 was killed by an invading loon. Despite a torpedo-shaped body that enables it to fly at nearly 100 mph and dive to depths of 200 feet, the loon has a design flaw. Its legs are so far back on the body that it needs a long runway to get up enough speed to take flight. Loons can barely walk at all on land, so a loon that comes to earth some distance from a substantial body of water may be stranded and die. It’s encouraging to know that loons can survive in places close to human habitation as well as wilderness areas, but there are a number of conditions that threaten their existence. Loons are carnivores who eat mostly fish and other aquatic creatures, so they may starve because of reduced fish populations, or ingest lead sinkers that have been swallowed by fish and die of lead poisoning. Pollutants such as fertilizer runoff can damage a lake’s habitat to the point where loons can no longer breed or survive. PWCs and other watercraft can drive loons from their nesting sites, wash eggs and chicks off a nest with their wakes, or even run over and kill them. Loons are an indicator species whose presence on a lake indicates that the lake is healthy. To keep Round Lake healthy and keep the loons coming back to it, Lakeside Club members and other residents of lake property should follow some commonsense guidelines. Keep boats well away from places where the loons are swimming, especially nesting areas, which are marked by distinctive buoys. It’s best to watch them from at least 200 feet away, using binoculars or a spotting scope. Don’t fish or cast near loon nests or swimming loons, avoid the use of lead sinkers, and pick up monofilament fishing line in which loons can become entangled. Never throw trash into the lake, especially plastic items that might trap a loon. And don’t walk your dog anywhere near a potential loon nesting area. LoonCorps is a local organization dedicated to protecting and preserving loon nesting areas. The founder of LoonCorps is Jeff Lange who, with a crew of volunteers, built an artificial nesting island (ANI) and moored it on one end of Round Lake. 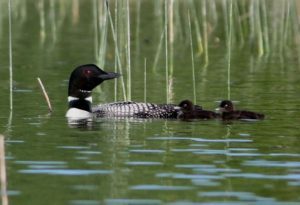 Loons and their chicks are very vulnerable to predators, especially when they nest on shore, so the ANI provides a reasonably safe and secure place to raise a loon family. Loon nesting areas are also protected by warning buoys to prevent boaters from approaching the loons too closely. Since LoonCorps is an all-volunteer organization, it needs help to place and maintain the artificial nest islands and warning buoys it sets up every year, and to report observations of loon activities either from the shore or by boats (preferably non-motorized boats such as canoes or kayaks). Members of Lakeside Club could help out with this effort by selecting Volunteer on the LoonCorp website at https://looncorps.org/. 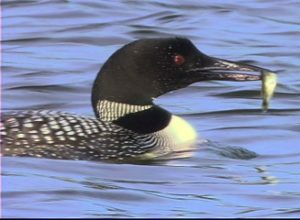 On the website you can also learn more about loons and order a copy of Jeff’s video “The Uncommon Loon,” which was filmed entirely on Round Lake. Go to Uncommon Loon to see a trailer from that video on YouTube. Loons aren’t the only fascinating creatures in the area around Lakeside Club. Check out Jeff’s Video about the inhabitants of nearby wetlands. This report will attempt to keep you updated about the activities of the loons on Round Lake. Reports of loon observations by Lakeside Club members will be appreciated: contact John Lehman at jwillehman@gmail.com. You can also read updates on the LoonCorps website at https://looncorps.org/. April 6. Sadly, Loon Corps founder Jeff Lange passed away on February 26 this year while snowshoeing around his home. According to Jeff’s partner Lee Anne Whitman, his family plans to keep LoonCorps alive. Oct. 26. 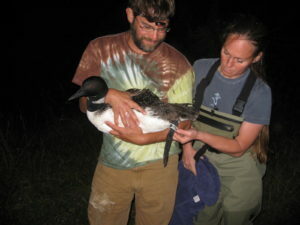 A chick was lost to an invading loon. The other chick was under attack, but a local resident on Round Lake, Ron Pool, jumped into a kayak and drove it off. At that time the dead chick was found about 100 yds offshore. There was another attack on the remaining chick but it was found the next morning swimming alone. Since then, the surviving chick suffered no deadly attacks known to the lake residents, and there is every reason to believe it has flown off the lake to begin its migration. LoonCorps is discussing whether to attempt to encourage the loons to establish a second territory on the lake by placing a nesting raft in the NW corner off Conservancy property. While there’s no guarantee that installing a raft actually can encourage loons to nest, it has been done on nearby lakes (Douglas, for instance) in recent years. July 14. The Round Lake loon pair hatched 2 chicks in what is becoming a typical late nesting pair, or a nesting pair that is experiencing a failed first nest and having a successful go at a second nest. July 2017. A nesting loon was spotted on a secluded shore of Round Lake. About a week later Jeff Lange reported “When I arrived at Round Lake this morning I saw (and filmed) 2 tiny loon chicks with their parents. Newly hatched, and cruising the south end with their very devoted parents.” The loon parents had scorned Jeff’s ANI, but at least they had a succeeded in adding one more loon to the population of Michigan. The second chick was not seen again. It probably fell victim to an eagle or one of the snapping turtles that inhabit Round Lake. There had been a nesting pair of loons on Round Lake for many years, but the resident male was chased away by a competitor in 2014 and no chicks had hatched since then. In the interim the loons sorted out who would rule the territory. At least one of the current loon parents is a pre-2010 native, because the band installed on him is still intact.